Of all of your vehicle’s various components, the windshield is obviously nowhere near the most important. In fact, it is something that most drivers tend to basically ignore other than perhaps occasionally cleaning glass when it begins to become overly dirty and affect their visibility. Of course, major cracks and other damage can interfere with a driver’s ability to see clearly just as much as dirt, dust and grime. This is precisely why police often won’t hesitate to issue a ticket any time they feel that windshield damage seriously impact a driver’s visibility and prevents them from seeing the road and traffic in front of them clearly. In this case, you’ll be left with no choice but to have your windshield completely replace. Luckily, these simple tips should help you to protect your windshield from damage and thus hopefully increase its lifespan. Most drivers are aware of the potential damage that the sun’s excessive heat and harmful UV rays can do to their vehicles. From causing your car’s paint job to fade and discolor to wreaking havoc on your vehicle’s interior, there is no doubt that prolonged exposure to the sun can lead to major cosmetic damage that both affects how your vehicle looks and decreases its value. Preventing this type of damage to your car’s interior is usually as simple as using a window shade, which should at least help to protect your dashboard and some of the interior from some of the damaging UV radiation. However, most car owners are unaware of the potential damage that excessive heat can also do to their windshield. Changes in temperate cause the windshield to expand and contract, and the glass obviously heats up far more when directly exposed to the extreme summer sun. Over time, this continued expansion and contraction causes the glass to weaken, which in turn makes it more susceptible to chips, cracks and other damage. For this reason, it is a good idea to always park your vehicle indoors or in a shady spot whenever possible and especially during the hotter parts of the year. Chips and cracks can occur at any time and are usually a consequence of a vehicle in front of you throwing up rocks that then strike the windshield. When this happens, it is vital that you have the damage repaired immediately. Many smaller chips and cracks can easily be repaired as long as you get the job done soon after the damage occurs. Still, if you wait too long, temperature fluctuations will eventually cause the damage to grow. In fact, cold weather can cause a small chip to turn into a major crack overnight, in which case it is usually necessary to have the windshield replaced entirely. The average cost of a windshield replacement can range anywhere from $100 to $400 or more, which is far more expensive than what it would have cost you had you repaired the damage immediately. One of the simplest ways to protect your windshield involves changing your driving habits. Many people have a tendency to follow the vehicle in front of them too closely, and this can quickly lead to a chipped, cracked or broken windshield. In this sense, one of the best things you can do is to always maintain a safe distance between yourself and other vehicles to lessen the chances of your windshield being hit by rocks thrown up by the vehicle in front of you. Moreover, you should always increase your following distance on dirt roads, in construction zones or any other time you suspect there may be sand, gravel, rocks or other potentially dangerous debris on the road. Obviously, there will be cases where there’s nothing you can do to prevent windshield damage—especially if it occurs while the vehicle is parked. Still, it is essential that you have the damage repaired immediately no matter the cause. 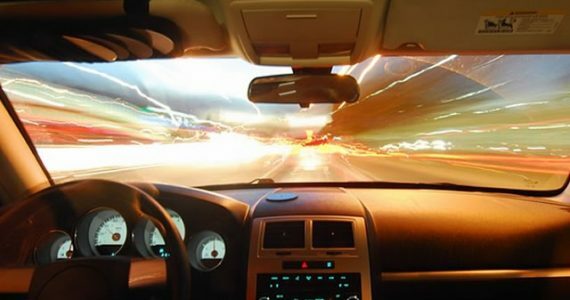 Crash test results have repeatedly showed that even minor damage greatly increases the chances of the windshield popping out or possibly shattering during an accident. In this sense, protecting your windshield from damage and having it repaired or replaced as needed will also help to ensure you and your family remain safer on the road.